Civil Litigation is designed to provide apprentice solicitors with a comprehensive understanding of the practice and procedure in the most commonly encountered aspects of civil litigation in this jurisdiction. The manual sets out the steps to be taken by a solicitor in an action from the District Court, the Circuit Courts, and the Superior Courts, from initiating or defending the action to enforcing the order and preparing the costs. There are separate chapters on the practice and procedure of each of the courts, limitation of actions, discovery, injunctions, judicial review, civil evidence, litigation costs, client care, and file management. The second edition also includes two new chapters: one on personal injury litigation; and the other on summary procedure and enforcement of judgments. Many of the chapters also feature helpful sample precedents. 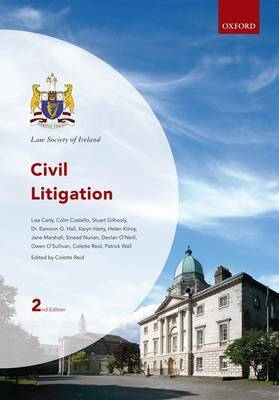 Civil Litigation is essential reading for apprentices studying on the law Society of Ireland's Professional Practice Course and provides a useful reference guide for Irish practitioners working in the area of civil litigation.